We have put together 5 videos that explain Advanced Work Packaging. The whole concept has been broken down into 5 segments and are best viewed in order. Advanced Work Packaging / Advanced Work Planning is the systematic application of proven construction practices that enable productive activity. This is the beginning, the transformation of industry to a model of project execution that delivers predictable project results by applying the AWP process to construction projects. So what is Advanced Work Packaging, why do we need it and how does it affect you? The simple explanation is that the process of Advanced Work Packaging guides the dissection of project scope so that it supports the execution of Workface Planning in the field. It starts with the processes upstream of the Construction Work Package and aligns engineering work packages with procurement work packages. This populates the construction work packages with all the drawings and materials and gets them ready to be carved into Installation work packages by the construction team. In a coal mine, the workface is that point where the pick hits the coal, in our world of construction it is that point where our tradespeople turn materials into a functioning plant. Therefore, Workface Planning is the process of identifying what these people need and what we must do to get it to them. Information management is a strategy that starts with the idea that everybody on the project needs information. So, when we develop information we need to make sure that all the right people have access to it, it is compatible with other project information and it is formatted to be interoperable. If you look at any model for solving problems, it always starts with a lot of focus on “what is the root cause?”. When we look at the industry’s track record for project execution you will see that we consistently blow schedule and cost estimates by large margins. When we look at the root cause of these results, we often identify productivity as a major issue. Then if you take the time to have a hard look at productivity you will see that we typically have eager, well-qualified tradespeople, standing around waiting for materials, tools, documents or access that they cannot readily obtain. That means that the average worker on the average project spends 4 out of every 10 hours doing what we want them to do. The rest of their day is typically a mixture of preparation and downtime while they wait for their Information, Tools, Materials or Access. The good news is that this means that there are lots of opportunities on the table. Coming back to our problem-solving model, the fix for most problems is the opposite of the root cause. So, if the problem is that the workers don’t have what they need then the fix is an Installation Work Package that has the right materials, tools, documents, and access, prepared in advance for each Foreman and crew, each week. It’s not rocket science, we really should know that we can execute work before we start. But, on a project where the Foreman relies on other people to organize stuff, it is very difficult to get these stars to align. So, that is why the industry has identified Advanced Work Packaging as a Best Practice. A systemic process for developing consistent alignment between Engineering, Procurement, and Construction. It’s not quick, it’s not easy, but it works. 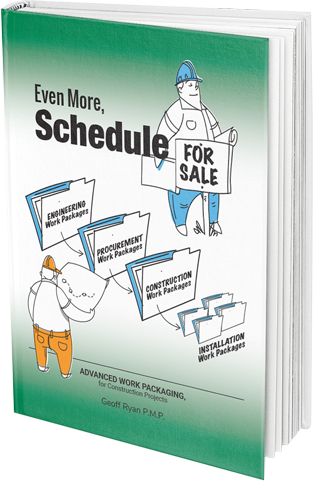 The Construction Owner’s Association of Alberta and the Construction Industry Institute have 10 years of case studies, that show that you can reduce the Total Installed Cost of projects by up to 10% by applying Advanced Work Packaging. This comes from a 25% improvement in labor productivity. The investment for this benefit is about 2% of the cost of labor, which means that you get a return on your investment of about 1000%, along with world-class safety performance, aligned quality objectives, a good measure of career-boosting project performance and may we also add – a good night’s sleep. Beginning the journey of applying Advanced Work Packaging. Starting at the front end from the appointment of the AWP Champion to the creation and delivery of complete packages from engineering and procurement to the population of construction work packages. So, now it’s Monday morning and you know that you want to apply Advanced Work Packaging, but where do you start? What does it really take to end up with ‘Every Foreman holding a constraint-free Installation Work Package, every Monday morning’? It starts with the assignment of an AWP Champion, just like we do in Safety or Quality, we appoint somebody to steer the ship and be responsible for the application of the processes that will ultimately produce constraint-free Installation Work Packages. As a member of the project management team, the AWP champion is responsible to develop systems and processes that support the holistic logic of Advanced Work Packaging, Information Management and Workface Planning. One of the first tasks for the AWP champion is to develop the AWP team starting with the appointment of an Information Manager. It is the Information Manager who ultimately becomes responsible for applying the Information Management procedure that guides the generation and management of project data. The AWP Champion’s next task is to develop AWP, IM, and WFP procedures that are fit for purpose and synchronized with the project. This creates a foundation that allows the Procurement Team to include the requirement for AWP in all of the project’ s contracts. This is the cornerstone of the entire process that will bite you if you don’t get it right. Working together with the AWP Champion and the Project team, the Information Manager will develop the Work Breakdown Structure to support the elaboration and synchronization of Scope, Time and Cost. Once the key stakeholders have been engaged the AWP Champion will facilitate a Path of Construction workshop with the Construction Execution Team that will identify the Optimal Path of Construction. The sequence of construction represented by single discipline Construction Work Packages can then be played back in 4D utilizing the WFP software. This refines the process and creates a common vision for development and execution. This creates a CWP release plan which then develops into the level 3 Project Schedule. The schedule identifies the sequence, contents, and timing of the engineering and procurement work packages that are required to support the CWP Release plan. The Engineering team is then responsible to create and deliver whole engineering work packages that satisfy the schedule and ultimately the requirements of construction work packages. Measuring Engineering deliverables from the ground up, just like real life construction requires. The bill of materials from the engineering work packages is then used to develop fabrication and procurement packages which, in turn, ensure that materials are fabricated and procured as complete packages, in the correct sequence. The creation and delivery of complete packages from engineering and procurement leads to the population of construction work packages with all of the drawings and materials required to execute the work. Transitioning from Information Management into Workface Planning, creating Installation Work Packages (IWP), the Workface Planning Coordinator, moving into construction. In parallel with the AWP activities the Information Manager, working with the AWP Champion and the Engineering team, will review and select a version of Workface Planning Software that is fit for purpose. The choice of software will be influenced by its compatibility with the existing 3D software, the maturity of the project and the quality, variety and source of project data. The IT group will work with the Information Manager to establish a robust project server that will host the software and provide simple and direct access for all the project stakeholders. Following the selection of WFP software, a workshop between engineering, the software vendor and the Information Manager will identify the data requirements, component attributes, naming conventions and the alignment of design areas in the 3D model. Utilizing the project server, the Information Manager will then facilitate the development of an online Hub for the storage and exchange of Project documents and data. The Data Hub will be the single source for all project documents, for all stakeholders. Permissions will be set that allow Engineering to store IFC drawings and for Construction Contractors to retrieve them. The requirement for data consistency amongst material components and the delivery of electronic fabrication data is mapped out in the IM procedure The Information Manager works with the procurement team to emphasize this requirement along with the sequence of procurement and fabrication that supports the Optimal Path of Construction and the CWP release plan. With the requirements for the 3D model, document control and procurement laid out, the Information Manager now turns their attention to refining the project nomenclature. Based upon the work breakdown structure, a format is established that links drawings, materials, schedule activities and cost codes to construction work packages. This facilitates a correlation between these components during construction when we need to synchronize work, time and cost. One of the key functions of the workface planning software is it’s ability to calculate planned value for each model component. In order to achieve this the Information manager coordinates with the project controls team to develop a matrix of installation rates and rules of progress that are then loaded into the software. With the foundation of the work breakdown structure and the process for developing planned value in place, the Project Controls team can now develop cost codes that capture earned value and roll up to track cost performance at a CWP level. Transitioning from Information Management into Workface Planning, it is now time to prepare for the creation of Installation Work Packages and the execution of work. The first and most critical component is a Workface Planning Coordinator, typically a member of the Construction Management team appointed by the AWP Champion. One of the Workface Planning Coordinator’s first activities will be to work with the Information manager and the software vendor to populate the WFP software with all the elements that are being created in detailed design and fabrication. This brings the 3D WFP software to life, at which time we start to see the full potential of project information visually represented, in a 3D environment. Moving into construction, the Workface Planning Coordinator, working with the Construction Contractor, develops a department of Workface Planners and trains them on how to use the software to create installation work packages. The Coordinator manages the department to ensure that constraints are identified and removed and that the department maintains a backlog of executable work. Training sessions conducted for field supervisors and construction management will define their changing roles and responsibilities in support of Workface Planning. As each CWP enters the 90 day window the Superintendent and Workface Planner refine the scope and create an outline for the development of installation work packages based upon the Superintendent’s execution strategy. The workface planner develops the packages and then works with the accountable parties to remove any constraints. The creation of IWPs for each CWP populates the rolling wave 90-day, level 5 schedule, as individual week-long activities. As the materials are confirmed through soft allocation, the IWPs move into backlog, which is then used to develop the three-week look ahead. The sequence of activities in the schedule is then linked to IWPs in the 3D model and played out as a 4D simulation of construction. As IWPs enter the three-week look ahead, the onsite material team bag and tag components so that they are staged and ready to ship and the scaffolding team erects scaffolds to provide access. Immediately prior to being issued to the field, the IWPs are rechecked to ensure latest revision documents, prerequisite work is complete and construction equipment is available. Then finally after all this preparation, we reach the objective: the IWP is issued to the foreman, a couple of days before it is due to start so that they can prepare to execute the work. Along with the tracking of delays and earned value management, we also conduct tool time surveys as a means to monitor productivity. These field surveys capture statistical activity levels of the craft workforce that allow us to plot monthly trends and compare results against industry averages. The tool time studies also record specific events and field level processes that highlight productivity issues outside Workface Planning. The management of these opportunities leads to continuous incremental improvements. Looking at the big picture, it probably looks big and complex, but hopefully, now you have a better understanding of how all the instruments contribute to the orchestra. Before we wrap up, let’s have a look at one more way to dissect the infographic that may help you segment the phases. The entire roadmap is divided into three areas that match the three procedures: Advanced Work Packaging, Information Management, and Workface Planning. The appointment of the AWP Champion, the creation of procedures, the path of construction, the level 3 project schedule and the philosophy of work packages for engineering, procurement, and construction. The Information Management roadmap covers: The appointment of the Information Manager, the selection of Workface planning software, 3D model attributes, Procurement information, Document Control, The Work Breakdown structure, work package nomenclatures, Earned Value management and cost coding. The Workface Planning portion of the roadmap covers: The appointment of the Workface Planning Coordinator, the development of Workface Planners, the implementation of Workface Planning software, the creation of installation work packages with the removal of constraints, the population of the level 5 rolling wave schedule, the three-week look ahead, the execution of work in the field and the measurement of progress through earned value management and tool time studies. ‘Even More, Schedule for Sale’, available through our website. The entire roadmap is divided into three areas that match the three procedures: Advanced Work Packaging, Information Management, and Workface Planning. Have Questions? For an in-depth look and understanding or Advanced Work Packaging and Workface Planning Geoff Ryan of Insight-AWP has written 2 books. "Schedule for Sale" and "Even More Schedule for Sale" takes you through it step by step. If you want to know AWP and WFP then you need to read these books. We do, and most often we make the passive choice to leave good productivity behind because we don't fully understand the link between preparation and productivity. 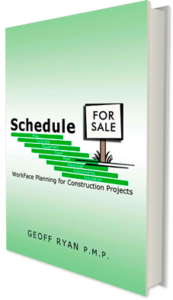 In this follow-up book Geoff describes the step-by-step application of the industry’s best practice of advanced work packaging and ties it into the logic from the first book, Schedule for Sale, on workface planning.